How Can I Go 1825 Inn Bed and Breakfast? 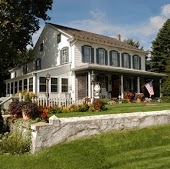 Where is 1825 Inn Bed and Breakfast in Palmyra on the Map? This location has 26 reviews from customers. The rooms are gorgeous, the breakfast is scrumptious, and hosts are wonderful! What a lovely place! We stayed in the hearts and flowers room and it was bright, beautiful, cute and clean. The innkeeper was accommodating, helpful, friendly and a pleasure to speak with. The breakfast was delicious!!! They were even happy to make dietary accommodations (I am a gluten free, dairy free vegetarian) just let them know ahead of time and they are happy to help. They even have a DVD, book and puzzle library as well as a gift shop. Great coffee and a wide variety of teas and a little snack bar with microwave, ice machine and mini fridge for guests... They have thought of everything here! I highly recommend it! Cozy, cute and charming! 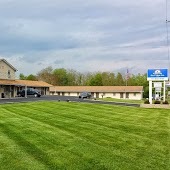 Great location, central to Hershey and lots of shopping, restaurants and Troegs Brewery, with comfortable, inviting rooms and a delicious breakfast that would rival most restaurants. I definitely plan to stay here again! The 1825 Bed and Breakfast is absolutely charming in every way inside and out!!! Every room is decorated in an amazing way to give you a warm and comfortable feeling. Will and David thought of such nice details to make your stay pleasant such as: accessible use of the kitchen area for refrigerating your leftovers from dinner out, homemade cookies and coffee available, soda and ice buckets,Hershey candy around the rooms, games, magazines, movies, dinner menus from various places they suggest, great thick towels, and comfy sheets, even a towel especially for ladies make-up, small gift shop with unique special things and more. The breakfast is "out of this world" delicious!! and served with elegant table details. The grounds are beautiful to walk around and the porches are perfect relaxing places. I will definitely stay here again.